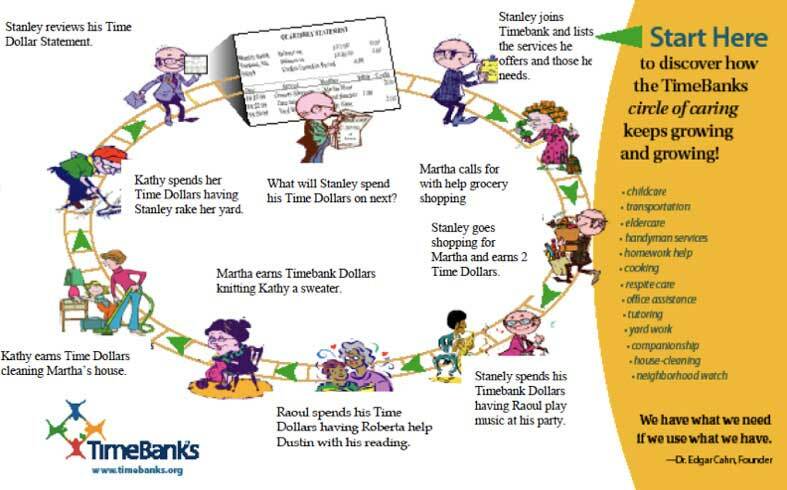 At its most basic level, TimeBanking is simply about spending an hour doing something for somebody in your community. That hour goes into the TimeBank as a TimeBank hour. Then you have a Time dollar to spend on having someone doing something for you. It’s a simple idea, but it has powerful ripple effects in building community connections. Each TimeBank has a website where you list what you would like to do for other members. You look up TimeBank services online or call a community coordinator to do it for you. You earn TimeBank hours after each service you perform and then you get to spend it on whatever you want from the listings. With TimeBanking, you will be working with a small group of committed individuals who are joined together for a common good. It connects you to the best in people because it creates a system that connects unmet needs with untapped resources. To see what happens each week when you are part of TimeBank is deeply fulfilling, especially if you are helping to make it run.